The quip left reporters chuckling at the press conference at the team’s practice facility before Keim went on to say that the two men work well together because of mutual respect, common goals, and clearly defined roles within the organization. “The team’s that are successful, they’re doing it as a team. Most of the ones that aren’t, egos are involved,” said Arians. Their extensions follow a new contract for Larry Fitzgerald, who displayed his willingness to put the team first by restructuring his contract to free up almost $13 million in cap space. Keim said last week that the extension will keep him with the team for essentially the next two years. Arians and Keim helped guide the franchise to 21 wins over the past two years, tying the team’s record for victories in consecutive seasons. Keim’s good-looks theory shouldn’t be discounted, but more likely the extensions are owed to the team’s success on the field. Regardless of the reason, the two men, who were hired nine days apart two years ago, were surprised and delighted by their new deals. Arians thanked everyone in the organization, from Bidwill to Keim to the players. He will be in his late sixties when the extension is up and said he has not set a limit for himself for how long he will coach. “As far as energy and passion, I probably have more of both than I’ve ever had for the game because I never thought I’d have this opportunity,” he said. Arians and Keim both took pride in a new opportunity given to former Cardinals defensive coordinator Todd Bowles and consider it a sign of the Cardinals success. Last month, Bowles was hired as the head coach of the New York Jets. Despite success on the field and staff members promoted by other teams, the coach and the G.M. emphasized that there is still more work to do. Their new deals will give them the chance to build on their success through the 2018 season. Less than two months after the end of the Cardinals season, Arians has celebrated his extension and is excited to get back to work. 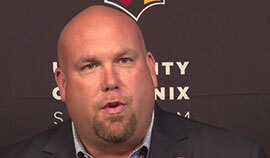 Bruce Arians talks about contract extension at the Cardinals training facilities.